This week I pore over a book I have treasured for years, A Year in Japan by Kate T. Williamson. 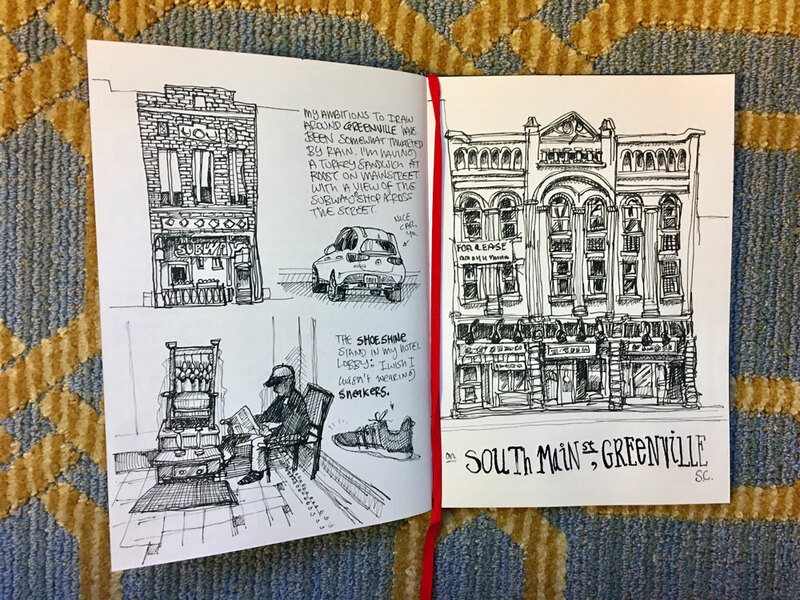 A stellar example of the travel journal, of design, lettering, and watercolor. I hope you enjoy it as I did. I’m heading to Greenville, South Carolina to give a couple of talks at the UCDA conference on Thursday and Friday. So far, the only suggestions I’ve received for what else to do in Greenville involves boiled peanuts. The one museum is closed for renovations and the other is all about Andrew Wyeth (I can take or leave him). I may have to settle for the Shoeless Joe Jackson Baseball Library. And some peanuts. I do my fair share of traveling (12 trips so far this year — and today I’m 3,000 miles from home again*) but I love to hear the tales of people who are truly committed peregrinators and who document and share their journeys. I recently met one such soul, Genevieve, a nomadic artist and environmentalist who is creating a lovely document of the world on her site, regenevieve.com. In a new blog post, she share recommendations of other traveling bloggers (including me). I hope you find some inspiration here. *I’m in Los Angeles for a couple of days to film a new teacher for Sketchbook Skool. Join us if you’re around for chinwagging and beerswilling. It’s all on this Facebook event.